East Asia with two boys under five? Sure, why not? The Tsou family takes on 13-hour flights, Michelin-starred ramen restaurants, and packed subway cars in a two-country trip across the world. The family of four visits the Meiji Shrine in Shibuya, Tokyo. Meet the Tsou family—Jen, James, Jude (age 4) and Jonah (age 2). Between work—Jen works in clinical diagnostic sales, James is in finance—church activities, and soccer games, this Austin, Texas-based family keeps a busy schedule. Still, they make time to travel as a family to places like Paris, San Francisco, and Rio. Needless to say, I had to investigate. Read on for her in-flight napping and entertainment tips, as well as insider advice on navigating the busy streets of Tokyo and Taiwan with two boys in tow. Nailed it: The Tsous get a mandatory shot in front of the cherry blossoms in central Tokyo. Perfect your plane ride: This was our third international plane ride with the kids, and I think we finally nailed it. Our two year old napped well on the inflatable WapWap Travel Pillow, which fits snuggly in the seat’s legroom zone, essentially creating a small bed. We also brought our go-to Cozyphones—earphones nestled into a soft headband—which double as comfortable eye covers. We aren’t against the iPad on long flights, especially for interactive, educational games like the PBS Kids Games app. I also love sticker workbooks and rely on loads of snacks. Road-tested stroller for two: We love the Zoe Double Stroller for home and travel. It’s light, narrow enough to fit through single door openings—even the Japanese subway elevator doors!—and is easy to fold. It also has sunshades and seats that nearly lay flat, meaning our kids can nap on the go. Book bilingual hotels: In Tokyo we opted for the Keio Plaza Hotel near Shinjuku Station largely due to its convenient location—it’s close to a subway station and great shopping—as well as its bilingual (Japanese and English) concierges. My husband mapped out a meal-filled itinerary, and many Japanese restaurants will only take reservations in Japanese, thereby only from hotel concierges on behalf of English speakers. Staying at an Airbnb? There is one alternative, a pricey online booking service, which costs about $35 per person per reservation. Jude gives “rice ball," a Taiwanese street food—and his new go-to snack!—a thumbs up on street at the National Center for Traditional Arts in Yilan, Taiwan. Keep it clean: Tokyo is a super tidy city, but there are literally no trashcans on the streets (though, interestingly, we did see a few recycling bins). Bring baggies with you to carry trash. Dining with the kids (and without): Our kids haven’t mastered using chopsticks, so we were relieved to discover that restaurants in Tokyo and Taiwan provided kid-friendly utensils, plates, and bowls. We even went to Tsuta, a Michelin-rated ramen shop, that provided toddler-friendly ware. Also, do your research on restaurant policies: A lot of high-end eateries in both destinations don’t allow kids under the age of 10. Use public transportation—with planning: We highly recommend using the subway system in Tokyo. It was easy, efficient, and clean. That being said, give yourself PLENTY of time—2-3 times more than Google suggests—to travel to and from Narita Airport to Tokyo. Even when we took the JR Narita Express (NEX), a high-speed train, and connected via the Tokyo Metro to the city center, it took time to move our luggage, stroller, and kids through connecting stations. There aren’t always elevators, and some subway cars are so packed you can’t board the first train that rolls in. Try to travel in off-peak times, or be strategic about which stops you board the train. Skip the tip: Tipping isn’t considered appropriate in Japan or Taiwan, so consider that a boost—the only boost?—to your wallet! Potty talk: In Tokyo, public restrooms are immaculate and super family friendly! In Taiwan, they are mainly squatty potties and can take some getting used to if you’re unfamiliar with them. Also most public restrooms in Taiwan do not have toilet paper, paper towels or dryers. Locals know to always bring packs of tissues. Triple check your passport: Taiwan, like many countries, doesn’t allow you to enter if your passport expires within six months of your trip. Tight on time? Research mail-in passport renewal programs like this one, which might cost more but save you a trip to the passport agency (or in my case, a passport agency in a city three hours away). Save room for souvenirs: Shopping is big in Tokyo and Taiwan, so leave room in your bag for gifts and purchases. If you forgot something—clothes, diapers, toiletries—you’ll find it here. In fact, some of our favorite finds were everyday items such as skincare products, cool laundry bags, and mosquito repellant stickers (keep an eye out for these in Taiwan—they’re DEET free and truly effective) as well as tasty snacks like Hi-Chews—which come in flavors like apple and grape—and a perennial favorite, dried seaweed. Hey kids, Japan is known the world over for things like sushi, cherry blossom trees, and sumo wrestling. Do you know what else is famous in Japan? It's delicious, colorful, and crazy CANDIES! Here are a few to look out for in Japan. You can also find these at some specialty grocery stores and online! You may have had a KitKat before, but was it made with pears? Strawberries? Green tea? In Japan, you'll find KitKats in a variety of cool flavors! 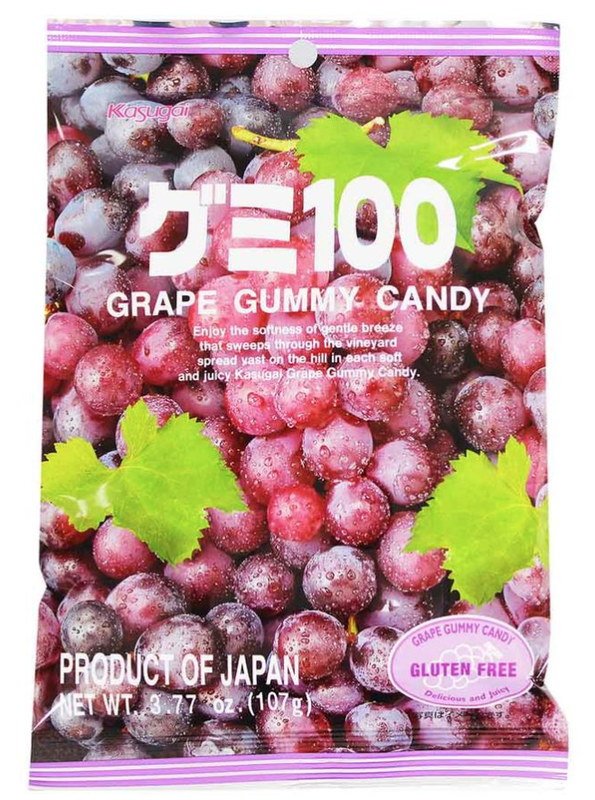 These chewy candies have a huge burst of fruit flavor, whether you choose a bag of kiwi gummies, lyche, or my favorite—muscat grape. These candies were originally invented in Japan as a substitute to gum because it's considered impolite to take food out of your mouth. Today, the super fruity, super chewy candies come in over 100 flavors—from pineapple and mango to açai and passionfruit. Headed to Tokyo and Taiwan with kids and want to know more about the Tsou's itinerary? Drop me a line below.